Beyond your bottom line, project delivery dates, and risk of ownership, lies onsite safety. Managing risk onsite and scaffolding safety can mean the difference between life and death. This isn't us being dramatic. An estimated 2.3 million construction workers, making up 65% of the construction industry work on scaffolding frequently. Protecting these workers from scaffold-related accidents would prevent 4,500 injuries and 50 deaths each year. At SafeSmart we take the safety of you and your team very seriously. 1. Make sure your equipment is safety compliant. Safety compliant height access platforms are penultimate for onsite scaffolding safety. Reduce your risk of ownership by working with a scaffolding supplier that guarantees safety compliance. Browse our range. 2. Understand and respect load capacity. The weight a scaffold has to withstand is one of the key factors often overlooked during the design phase. It's important to plan ahead with a clear understanding of the desired load capacity and number of workers the scaffolding system will need to support. Fitting more workers on a system that can't handle it or overloading it with equipment is dangerous and should be avoided. 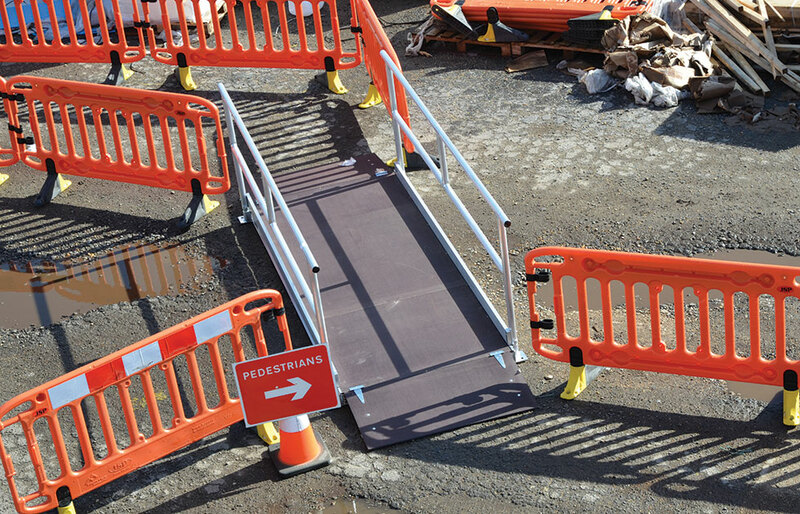 Look towards our Proscaf system for a sturdy and reliable height access solution. 3. Secure your scaffolding properly and allocate time for prep work. There are several measures you can take to ensure that your system is secure before you begin work. Make sure the base is sound and adjusted, legs plumb, braces in place, and planks, decks and guardrails installed and secure. Your scaffolding system must be adequately braced or tied to a building to prevent against movement that may dislodge an end. 4. Ensure that individuals working at height are properly trained. Training should cover important safety practices such as getting on and off scaffolds (i.e. the use of an access ladder not the scaffold frame.) Safety training should also cover comprehensive fall protection, erecting and dismantling procedures, and other lifesaving details specific to the height access system in place. 5. Guardrails, they're a must. The design of your scaffolding must have at guardrails on at least three sides facing away from the building. 6. Routine inspection and maintenance. Routine inspection and tests of all components of your height access solution will ensure that any pieces that are broken and damaged are replaced before they can cause dangerous situations onsite. 7. Keep things tidy. It's important to store tools and materials neatly so as to ensure the platform is free from obstructions. 8. Keep your balance. A scaffold must be perfectly level, with CSA standards stating that it shouldn't deviate from the vertical by more than 12 millimetres for ever three meters of height. 9. Use appropriate PPE. Wearing the right head protection, non-slip protective footwear and fall protection penultimate for safe height access. 10. Make sure you have the right equipment for the job. Each job is different and may require specific types of equipment. Multi storey construction projects often require sturdier steel scaffolding as compared to other applications. Find out if your height access platforms are best suited to the job at hand. Give our friendly team a call or enquire online to speak with an expert today.